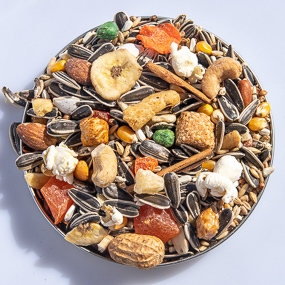 Island Treat Mixes makes hand crafted gourmet food for your bird! We use all the things birds love to eat! All mixes are custom blended specifically for either parrots, small hookbills, cockatiels and parakeets. They go nuts for it! The aromatic, all-natural combination of choice ingredients and our special process to put them all together paired with years of experience with top Parrot breeders and devoted bird owners will make your bird say "AHHH". You've just got to try our blends once to see the difference - the reaction of your birds and how much less of the mix goes on the floor. We never have mixes sitting around for weeks or months waiting for an order. We custom blend the mixes as the order comes in to guarantee the ultimate in freshness.